Waking up at 7am to catch a 7:53am train from the South Coast to London Victoria paved the way for what would turn out to be a packed but thrilling day at the Tale of the Brave blue carpet premiere. Turning up at Leicester Square for the 10am arrival, a replica of Thomas and the appearance of The Fat Controller by a VIP arrivals spot was greeted by the PR team at Halpern. My faithful contact Candice, who I had been speaking to in the lead up, directed me to the foyer where the after-party would eventually take place. Complimentary cupcakes, nibbles, Thomas fruit juice and smoothies from waiters were on offer to all the guests, as a few at a time, several parties made their way into the foyer to the backing track of Engine Roll Call, which I eventually heard looping for over an amassed 30 times! A table of Tale colouring pages were layed out as was a Wooden Railway play area. One guest of which early on was Wilbert Awdry's daughter, Veronica Chambers. Thomas and The Fat Controller face the music. Taken by Louie Sparkes. It was a conscious sense not to approach bearing in mind the passing of loving sister Hilary Fortnam. Ten minutes pass and Mark Moraghan in smart casual wear and a leather jacket shows up with his wife and two kids before light entertainment from Sharky & George started to show fun tricks to children, at one point right near a bemused Moraghan! Presenter Vanessa Feltz makes her way in as a gentleman who I remember from the past walks near me and starts to check his bag. Greeting him, it was Alf Fortnam, widow to Hilary who I encountered along with Veronica and Hilary after the Day of the Diesels premiere in Hamleys Regent Street. Alf recalls this and we get into conversation about each other's hobbies. He accepts his wife's passing by tributing her tireless work for the Christian faith and mentions the public debate in the press about her attempts in changing the winter holidays scandal. I reply to how the said issue resulted in delaying Merry Winter Wish's by a year, something that he was unaware of but knew about the re-dubbing happening behind-the-scenes. Another gentleman pops over and introduces himself revealing to be the Awdry's manager, whose name unfortunately couldn't be heard owing to the noisy environment. He comments on Hilary and brother Christopher Awdry's infatuation for their father's work. I question why Christopher doesn't turn up to the premieres. Alf gives an understandable answer that he likes to keep a low profile and wants it to stay that way. I ask if he has anymore Railway stories in mind. Alf again quips, no, he is finished with it. He feels that the last one [No. 43. Thomas and His Friends] was the real closing chapter. It did say "THE END" at the last page. We thank each other for the chat and go to speak to other friends. Stills from Tale are seen up close on an overaching desk with Tale ham or cheese lunchboxes up for children's grub needs. 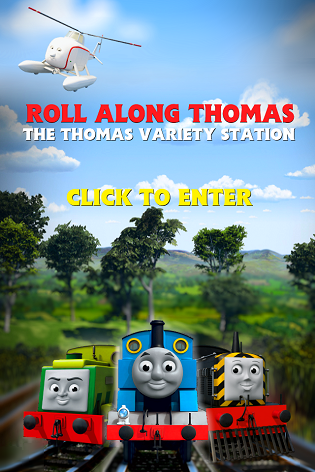 Next to it's left is a big artwork of Thomas, Percy and James as seen on the DVDs and posters. Mark Moraghan is then interviewed by a small camera crew of two talking about his role and the special. Five minutes later, I approach him and remembers me from a previous encounter, after performing in 9 to 5: The Musical in Southampton. I share a few tidbits of my week at the time including filming as an extra on a comedy show for ITV2 for late September till we speak of one of his upcoming films, Allies, on its trailer, premise and slightly confusing distribution. We're all called to go downstairs to Screen 5 so the both of us say goodbye. After starting to make my way to my seat, a familar face greets me. ellsworth who I hadn't seen since The Star Tugs Trust's Battlefield Railway convention in March. We catch-up on how we got to the event, who else is in the room, a few hush hushes on new episodes and the security of spoiling the film before we sit down in our allocated seats as the film is about to start. Tale of the Brave becomes the event of the week. Next to me sits a man with his family, similar to my age, who reveals himself to be one of the competition winners. Some talk of our travels, collection of DVDs ensues. Not before the lights dim and who pops in than none other than The Fat Controller to introduce the main attraction. He compères proceedings, encourages the children to feel the excitement and goes on to urge the following. Some laughter, wailing, gasping and open mouths later, the end credits finish and the audience applauds. It was very good. Everyone exits the room after 11am and make their way back upstairs for the after-party. A few minutes later, I rendezvous with ellsworth again as he talks to a woman with the Awdry manager who asks her to sign the Big Golden Book of Tale. I get puzzled, so she jokes with her presumed celebrity status. I introduce myself and she follows. I'm Sara Fortnam, I'm Alf's daughter. She then remembers her mother and jokes of her father dragging her out in the wet. Trading of what we do, she leaves a few moments later. One scene from the posters was not in the story. I then realise that someone is by my shoulder. A voice murmurs and a hand shake is offered. Ryan from SiF greets me after meeting briefly at the above mentioned Battlefield event. This time round, we talked more, as did fellow SiFer Christopher. Ryan comments on how brilliant the film was and of its strength in its story. He then mentions of my departure from the blog saying that for four years. The commitment was there and I can understand for it to be hard for you to do it when you have your life and career to look forward to in the way. Not every person can be free to keep on going with those fandom projects like us with our ones because we are in the same position too. The subject matter of Martin T. Sherman's departure from the US Thomas voice is brought up. Ryan tells me more of it which surprises me and another insider, but those things are perhaps best left unsaid. A woman comes over to give us our this time cotton goodie bags with Thomas chocolates, a poster, a Story Library book, a MEGA Bloks pack, a Take-n-Play model but no Tale DVD. Ryan and Christopher are confused as to why they have a copy each of The Complete Series 15. I go one up by discovering that I have two copies in hand! I then consider to give one to a boy I know near where I live, until Ryan steps in rather manically to prevent me from doing it. Some rude words are shared by him! The afterparty. The Fat Controller introduces the film. The goodie bag. We then go to meet a person who remembers the duo and is known as Ian McCue, producer for the show, who went on to explain how hard it is for head writer Andrew Brenner to think up the strengthness of material as witnessed in the film, even going to say that, King of the Railway was the starting point for the new times of the series but Tale of the Brave really packs a lot of punch with the emotion and isolation of the story and characters. We are then treated tellings of what's to come for the next few years concerning returning characters, what the focus is of the next feature-length special and big plans for the 70th anniversary of the brand. You are all in for a treat, you just have to wait and contain. Big things are coming, one of those is a real game-changer. Ian then directs us to a familiar face who shakes hands with all of us. Keith Wickham. Keith remembers of my interview he did for me near the blog's beginnings and goes on to say that , the film was great. I had a lot of fun with it. He then queries that Jonathan Broadbent probably based his Bill and Ben voices on a new Eric Morecambe and Ernie Wise. We then joke of what kind of classic comedians who seem fit for voices for future new or returning characters. I mention Tommy Cooper, to which Ian and Keith get in awe of. It was a matter of time before Ryan chose the inevitable Billy Connolly! Ryan and Christopher speak of their infatuation with Keith's Yorkshire Stafford being a perfect fit. Ryan jokingly questions of trying to get a Scotsman voice into the series. Keith reminds him of his Harvey voice. We all realise that Ryan did not even know that Keith voices the crane engine! Keith says goodbye, as does Ian. Friends in SiF. Hamley's Thomas & Friends area. Reuniting with two old mates. Ryan and Christopher are ready to leave as the former has to catch a plane back to his home of Scotland. He mentions that Louie is outside wanting to talk to him. I realise that this is the same Louie I know of Sparkes [skarlouie], a real friend. He is surprised to see me and I'm surprised to see him with Michael Evans [AardmanMike]. They are pleased to meet the two before hugs are given to see my friends again after a gap of three years. Posing for photos and joking around, SiF parts company. The remaining three of us have the time to hang out for a much needed catch-up. I share the film without spoiling but tease it rather delicately and what could be store for the three of us, based on earlier comments. We eat, partly during a quick typhoon of a summer storm for 15 minutes in the square, and lead ourselves to see merchandise in Hamley's and lark about. 6:45pm comes and we decide to part ways in order to get home safely. With the gleeful excitement that happened and the new friends made in life, it was a fancy day full of gossip and fulfillment, so thank you to the team at Hit Entertainment and the PR folks at Halpern for the day. It was lovely. See you next year for the next tale. Tale of the Brave: The Movie rolls into Vue cinemas across the UK from August 22nd to 28th. The DVD is released in the UK on September 1st, the US triple play Blu-ray on the 16th and in Australia and New Zealand on October 1st. Thomas & Friends' 18th Season premieres on Channel 5 milkshake! in the UK on August 25th at 7:35am, with the episode, Old Reliable Edward. Melad! First, you post "You're gonna stop." Then You put a question mark behind it. And Now, You remove The Update Completely. What is this, please say? The question mark was to lead people in on the announcement itself. I still have a few more articles planned out, which came very late on, until October. So, there you go.